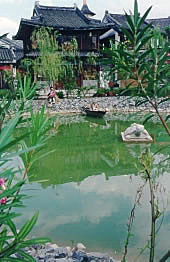 Tang Dynasty Village is a theme park that recreates the seventh century Chinese village of Chang 'An, the present day Xian. 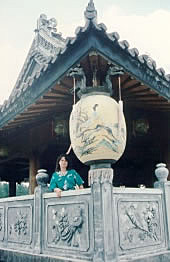 For Anne there were two attractions that lured her to Tang Dynasty Village. First it was surrounded by a life size replica of the Great Wall of China, something Anne and I have always wanted to see but haven't yet. And, second, there are over 2,000 of the terra-cotta warriors statues that were discovered underground in China back in the 1920's. She wanted to see them and this was as good as it gets without actually going to where they were discovered. Entering the complex the first thing is to climb the replica of the Great Wall and look at the village from above. 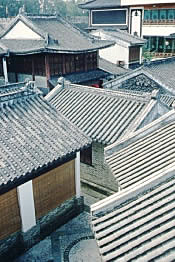 Atop the wall you get some idea as to the layout and size of Tang Dynasty City. For a tourist theme park (trap!) I have to admit it was well done. 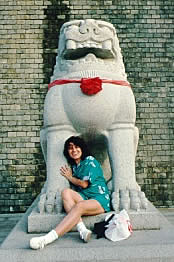 Sit back and enjoy some pictures from Tang Dynasty City. 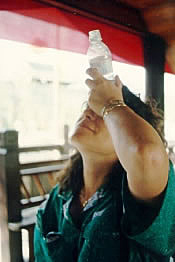 Anne (picture below) putting into practice her alternate cooling down method ... when an air-conditioned room isn't available, an ice cold water bottle to the forehead is a good substitute. Singapore being just a few degrees shy of the Equator is hot but not intolerable by any means. 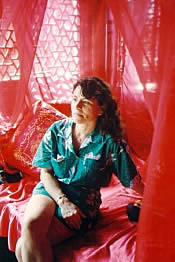 While we were there it was in the 80's and low 90's. Not bad for January and certainly better than the 20's and 30's I knew they were having at home! 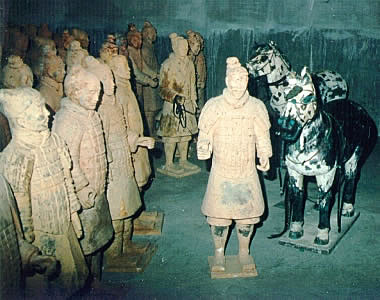 In the Spring of 1974 peasants and workers of the Yen Tsa commune in Lin-t'ung county discovered an underground army of terra-cotta soldiers and horses believed to have been buried for over 2,200 years. Ch'in Shih Huang Ti, the first emperor and builder of China's Great Wall, was buried in 210 B.C. 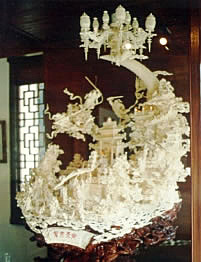 under an earth mound 15 stories high called Mount Li. While the site was known in had not yet been excavated when well diggers accidentally stumbled upon a large subterranean vault, part of the grave complex. This vault contained over 6,000 life-size pottery men and horses, an army of warriors, servants, and horses pulling manned war chariots. 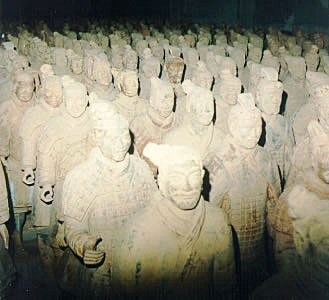 Amazingly lifelike, the terra-cotta army was for the most part intact and standing poised for the command to attack. 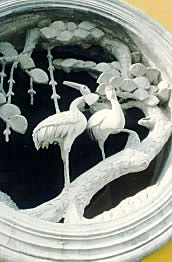 The detail embodied in each of the statues added a lifelike appearance to them. The horses forelocks were curled and their tails knotted. They pulled wooden chariots with leather harnesses and brass fittings. The soldiers carried real bronze swords, spears and crossbows. In some cases their hair was braided. The detail of these terra-cotta soldiers, buried for 2,200 years, was astonishing. 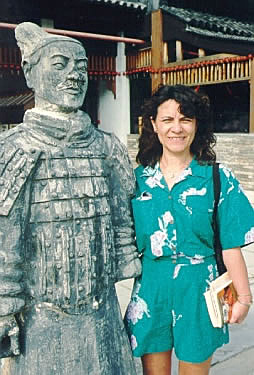 Anne, having followed the discovery of the terra-cotta army through the pages of National Geographic, was ecstatic that Tang Dynasty City had a collection of over 2,000 of the terra-cotta figures on display. 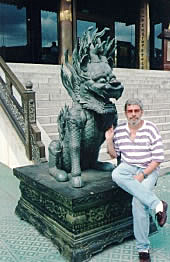 Visiting Tang Dynasty City then became a "must" for us. By all accounts it was thrilling viewing these ancient statues. A complete surprise to Anne and I that we didn't expect. We had no idea that such a place existed in Singapore until we arrived and began to collect the various tour flyers at the hotel. It's amazing what this world has to offer in terms of its history, and Anne and I have been fortunate to see much of it first hand. While these were replicas we imagined one day having the opportunity to visit the actual site near Xi'an, China and see the authentic terra-cotta warriors up close. 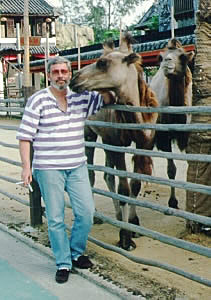 As you might expect, leaving Tang Dynasty Village I ran into a couple of old friends from Egypt ... some camels. Anne and I had the pleasure of riding camels to the base of the Cheops pyramid in Giza, Egypt back in 1984 and seeing this guy brought back some fond memories. Camels, as you may know, have a habit of spitting. This one, thank goodness, was nice and friendly and didn't spit. Had he I would have been a very unhappy tourist the rest of the day!